Looking for a new washing machine under 15000? You are at the right place. In this article, we take a look at the top 10 best washing machine under 15000 in India. In this list, we have covered both top and front load semi and fully automatic washing machines launched in 2019 or before. Washing machines from all top brands like LG, Samsung, IFB, Whirlpool, Panasonic have been listed here. One of the washing machines on this list is from MarQ which is Flipkart's own electronics brands. They have good quality at low prices, that's why we have included it. The capacity of semi-automatic washing machines varies from around 6.5 Kg to 8.5 Kg. If you have a family of 3-4 members go for 6.5 Kg semi-automatic machine, for larger families a capacity of around 8 kg is a better option as you can put more clothes at once. The capacity of fully automatic washing machines on this list varies from 6 Kg to 7 Kg. The semi-automatic washing machines are priced around Rs. 10000, while the fully automatic ones are priced around/under 15000. If you can spend a little more then do take a look at best washing machines in India under 20000. Let's take a look at our list of best washing machine under 15000 in India. For every washing machine, you will find its pros cons, features and brief review. Approx price and buy links to Flipkart and Amazon are also provided. MarQ is Flipkart's Electronics brand and they have launched plenty of great value for money products recently. This top load fully automatic washing machine is priced under Rs. 12000 and comes with a good capacity of 7.2 Kg. If you have a family of 3-5 members then this will be good for you. The motor on this machine runs at 700 RPM and has a power of 385W. There are 10 wash programs available: Normal, Jeans, Delicates, Mixed, Woolens, Express, Baby Wash etc. The appropriate wash program can be selected depending on the load quantity and the type of fabric. The wash programs can be selected from the top control panel. There is a digital display which shows the settings selected. With wash programs, you can also select 10 different water levels. One other interesting feature is self tub cleaning, just select it and the machine will wash the tub itself. The wash performance of the machine is good and at this price it an excellent choice. So go for it if you need a top load fully automatic washing machine in 10000 to 12000 budget. If you can spend around 3000 more then you can go for big brands like Samsung and Whirlpool. Whirlpool offers the best value for money washing machines in the top brands when compared to LG and Samsung. 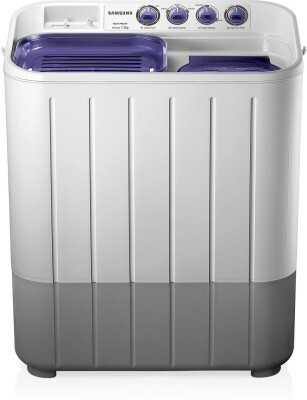 This WM Classic Plus is a top load fully automatic washing machine. It has a capacity of 6.2 Kg making it suitable for family with 3-4 members. For a bigger family, you should look for a 7 Kg to 7.5 Kg capacity which you can check here. This machine comes with 4 program function namely normal, speedy, heavy, delicate which you can switch between depending on the type of clothes and the cleaning they require. The drum in this machine has Spa Wash System, using which there is less tangling in clothes and hence the cleaning is more effective. The motor has a power rating of 360 W which is good for a 6.2 Kg machine. The rpm(revolution per minute) of the tub is 740 which is again very good and speeds us the dry process. It has all the basic function of auto restart and buzzer on completion of an ongoing operation. It is easily one of the best fully automatic machine under 15000. This is one of the best selling top load fully automatic washing machine from Panasonic. The build is great with a powerful motor which runs at 720 RPM. This fully automatic washing machine has a nice compact and durable body. It has a digital display on the top side which keeps you updated on the wash cycle time and various washing stages. The washing machine has a unique Sazanami Drum, with dimple-shaped waterspouts which helps to provide a gentle and effective wash. The machine also has an Aqua Beat function. The unique Aquabeat function efficiently removes stains and dirt from the fabric. The powerful splash action beats clothes to knock out tough stains and dirt from your clothes. Another function called Aqua Spin Rinse reduces the water usage during rinsing. There are 8 wash programs and plenty of useful features. The pricing is attractive as well. Overall a very good option for a family of 3-4 members. This machine is one of the best sellers and is rated 4.3 stars by around 3000 users which speaks about the quality of this washing machine. This is another semi-automatic washing machine from LG that offers strong build quality and a good brand value. It is costlier than the competitors but the build quality, functional performance and the durability are all top-notch. It has a capacity of 8 Kg which is easily suitable for a family with 5 members and can clean a lot of clothes in one go. It has 3 wash programs that you can use on the basis of fabrics of the cloth. It has a Roller Jet Pulsator that improves the efficiency of cleaning the cloth by removing every small particle. The power has a rating of 360 W which can easily roll the clothes. The spin tub has an rpm of 1000 and uses Wind Jet Dry Technology that removes moisture from the spin tub for quickly and perfectly dry the clothes. It has all the basic features like buzzer to alarm as the washing ends, 360-degree wheels for easy movement. LG offers 2 years of service and has the best service. It is one of the best-rated semi-automatic machines from users. This is a high capacity semi-automatic washing machine from Whirlpool with an excellent build and powerful motor of 350 watts power which is capable of running at 1450 RPM. The design looks great as well. The machine is well built and feels durable. There is a smart handle on the side and wheels at the bottom to move it easily. The control knobs are present on the top. You can select the type of wash, time of wash, drying time and drain water with the knobs. There are 5 wash programs available: Sari, Delicate, Normal, Heavy, Bedsheets. So depending on the load, you should select the wash program. A Super soak function is also available which helps to easily remove tough dirt and stains by continuous soaking and scrubbing action for 25 minutes with Super Soak Technology. The machine comes with Turbo Dry Technology which gives perfectly dry clothes in 15 minutes of sundrying. The washing machine comes with 2 years warranty on complete unit and 5-year warranty on the motor. Whirlpool provides decent after sales service. This is a great washing machine if you have a large family and need to wash a lot of clothes together. At this price, it is a good buy and one of the semi-automatic washing machines under 15000. So that was our list of best washing machine under 15000 in India 2019. We hope it was helpful and you were able to find a new semi or fully automatic washing machine for your home. If you need more options under 15000, take a look at best fully automatic machines under 15000. Let's take a look at our favorite now.